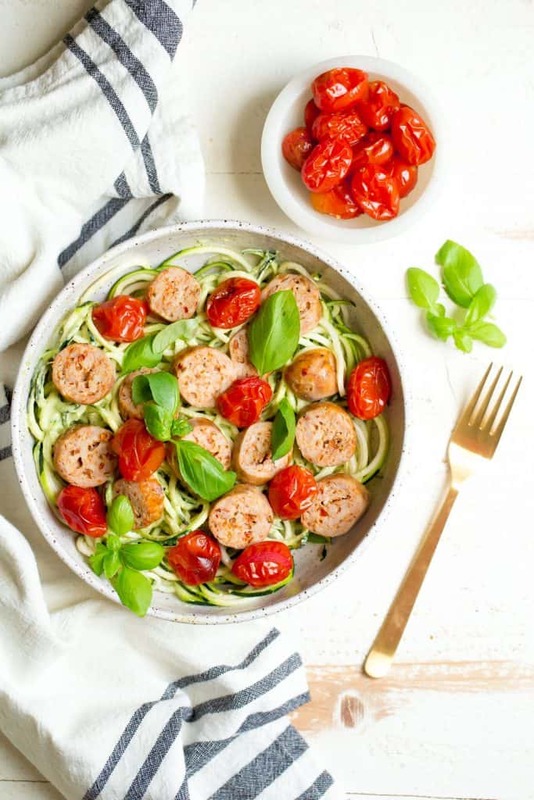 Avocado Pesto with roasted tomatoes and sausage, all tossed with zucchini noodles for a quick and simple weeknight dinner. 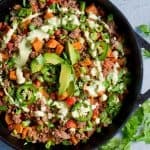 A one pan meal the whole family will love! Noodle bowls are met with great enthusiasm in my house. Especially with the addition of pesto!! 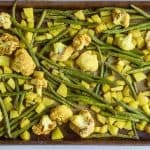 I’ve been working on 1 pan meals in preparation for the fall and the grind of the school year with our busy schedule. 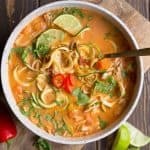 Ones that my kids will enjoy, the husband will dance about because he loves himself a delicious dinner, and must be super simple. These noodles are smothered in my new favorite pesto variation: with avocado instead of parmesan cheese. 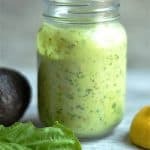 Pesto is a favorite around our house, and when I swapped out our old pesto with the avocado pesto, no one noticed. Instead the entire bowl was gobbled up and loved by all. Such a big hit that my kids were thrilled to have leftovers for lunch the following day. So about the one pan part…….I threw the tomatoes and sausage together into the oven and roasted for just over twenty minutes. While they roasted together, I whipped up the avocado pesto and spiraled the noodles. 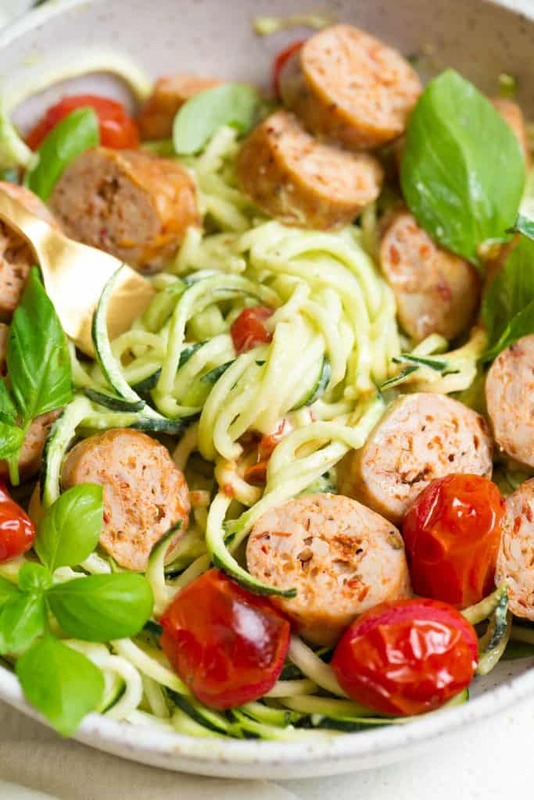 Feel free to use real noodles for your kids if that makes them more likely to enjoy the dish. 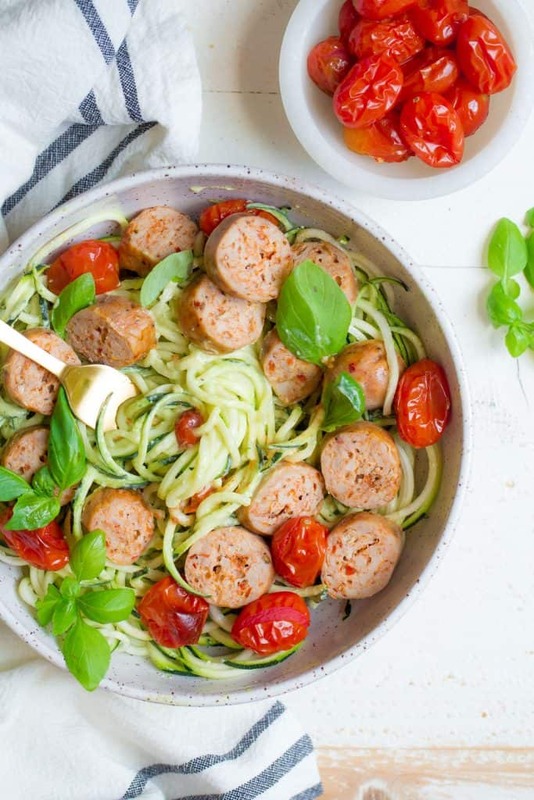 I usually do a half and half bowl for them with a little zucchini noodles mixed in with regular pasta. I’m sure you’ll enjoy it just like we did! 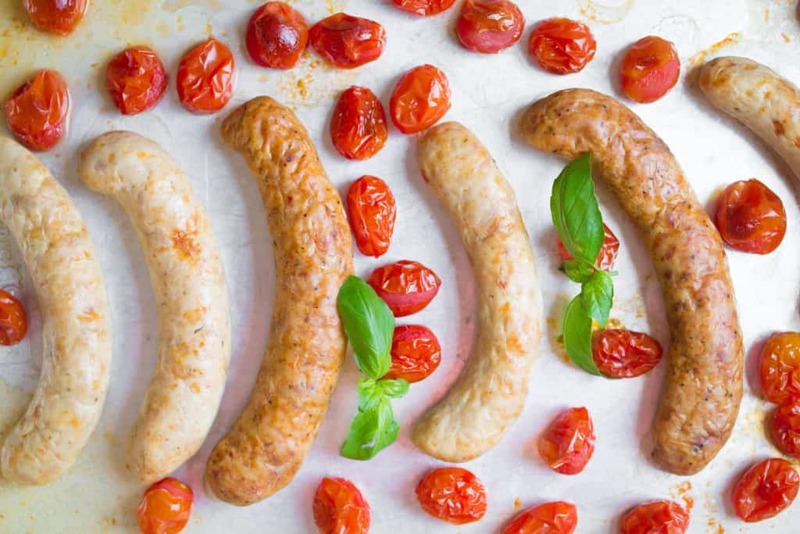 On a baking sheet, spread out your sausage and tomatoes. Lightly brush your tomatoes with olive oil. Bake for 20-23 minutes, or until sausage is no longer pink. Meanwhile, make your pesto. Place avocado, basil, garlic, lemon, pumpkin seeds, sea salt, and olive oil in a food processor or blender. While blending, slowly add water. Continue to blend until smooth. 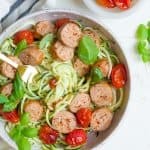 Toss, noodles with pesto, sausage, and roasted tomatoes. Top with extra salt and pepper to taste. 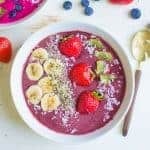 I have been obsessively perusing your blog for two days now – the recipes look great. Thanks for sharing them! Tonight I made this dish, and it was quite good. I’m still acquiring a taste for zucchini noodles, but I LOVED the pesto. 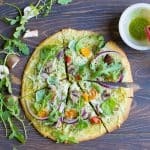 I must confess that I was pretty disillusioned about dinner as I was cooking and was about ready to order pizza, as it turned into a frantic rush with missing ingredients (mental note: check list instead of assuming….). 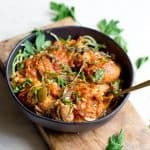 When I came back down after putting my toddler to bed, I discovered that, after Grandma had told the kids they could have some of the sausage and tomatoes by themselves if they would just try a few more bites – and when they did, they discovered they liked it. Like ate 5 bowls of it liked it (the 7 year old). The 5 year old finished her plate. I did make some adjustments and thought I’d share in case anyone finds themselves missing ingredients as well. With not quite enough basil blooming in the garden, I compensated with some spinach. Couldn’t even tell. I also used sunflower seeds instead of pumpkin bc I forgot pumpkin seeds and that’s what we had. I didn’t even miss the cheese in this! So good! I love this story! Thanks for sharing 🙂 And yes, I feel your frustrations with the food stuff. Sometimes I make things and my kids don’t like it. I just try to ignore it, hahaha! I think of all the things I didn’t like as I kid that I love now, and know that as long as I just keep introducing new things, it pays off years later. Hi! Is this made with shell-on pumpkin seeds, or shelled pepitas? Thanks so much!